Who Fares Best In The Draw? Well I guess it's about time we had a look at the AFL draw for 2009. The numbers show how many times a particular matchup occurs at home, away or at a neutral venue in terms of the team shown in the leftmost column. So, for example, looking at the first row, Adelaide play the Lions only once during 2009 and it's an away game for Adelaide. 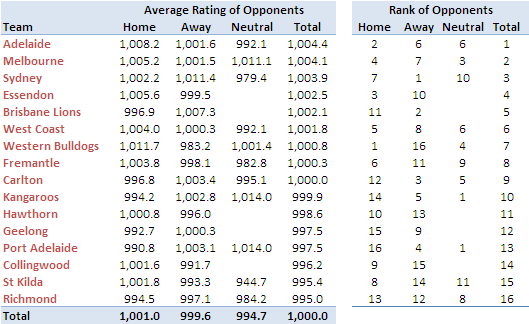 Given those, the table below shows the average MARS Rating of the opponents that each team faces at home, away and at neutral venues. So, based solely on average opponent rating, regardless of venue, the Crows have the worst of the 2009 draw. The teams they play only once include five of the bottom six MARS-ranked teams in Brisbane (11th), Richmond (12th), Essendon (14th), West Coast (15th), Melbourne (16th). One mitigating factor for the Crows is that they tend to play stronger teams at home: they have the 2nd toughest home schedule and only the 6th toughest away and neutral-venue schedules. Melbourne fare next worst in the draw, meeting just once four of the bottom five teams, excluding themselves. They too, however, tend to face stronger teams at home and relatively weaker teams away, though their neutral-venue schedule is also quite tough (St Kilda and Sydney). Richmond, in contrast, get the best of the draw, avoiding a second contest with six of the top eight teams and playing each of the bottom four teams twice. St Kilda's draw is the next best and sees them play once only four of the teams in the top eight and play each of the bottom three teams twice. Looking a little more closely and differentiating home games from away games, we find that the Bulldogs have the toughest home schedule but also the easiest away schedule. Port Adelaide have the easiest home schedule and Sydney have the toughest away schedule. Generally speaking, last year's finalists have fared well in the draw, with five of them having schedules ranked 10th or lower. Adelaide, Sydney and, to a lesser extent, the Bulldogs are the exceptions. It should be noted that higher-ranked teams always have a relative advantage over other teams in that their schedules exclude games against themselves. How Important is Pre-Season Success?